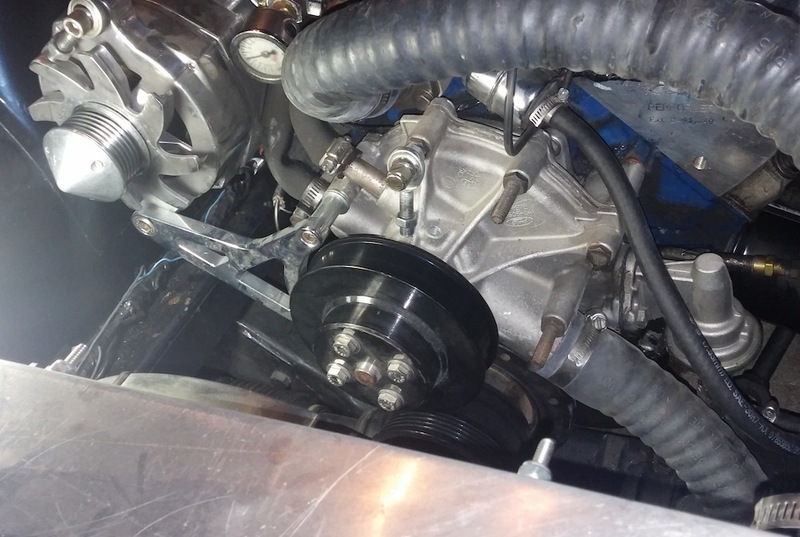 The belt was routed around the crank pulley on v-grooves, then with its flat side over the water pump pulley and then onto the grooved AC compressor pulley and across the engine to the grooved alternator pulley. The problem is that I lost my belt while driving the other day. I measured out the pulley arrangement and bought another belt... installed it, and it worked fine for a little bit but I kept having to lengthen the adjusting rod on my alternator mount to tighten the belt more and more. I then realized that the somewhat crude and custom built AC compressor bracket I had on the engine was flexing thus loosening the belt. Long story short, I removed the AC and the crappy bracket. Unfortunately, in order to just run the water pump and alternator, I'd need a clockwise spinning water pump. This means buying a new pump, a new belt, and potentially having to buy a new timing cover too... not to mention dealing with the whole job, breaking bolts, etc. What I'd prefer to do is put a pulley where my AC compressor was and keep my existing pump and new belt. Or would this work maybe? Last edited by darko; 08-26-2014 at 09:52 AM..
no PS pump ? no tentioner ? Should I also look to add a tensioner? I'm not opposed to it. Its not necessary though. i'm no mechanic, with that said seems to me the tentioner would allow for a belt to work properly. It would allow the belt to stretch.